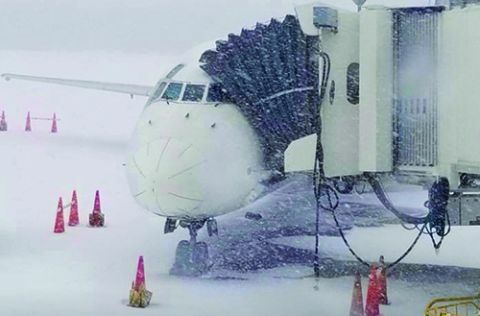 With temperatures hovering in the teens and up to 3 inches of ice accumulated on the runways, the Charleston County Aviation Authority and U.S. Air Force—which owns the shared runways—were simply not equipped to handle the highly unusual winter storm. 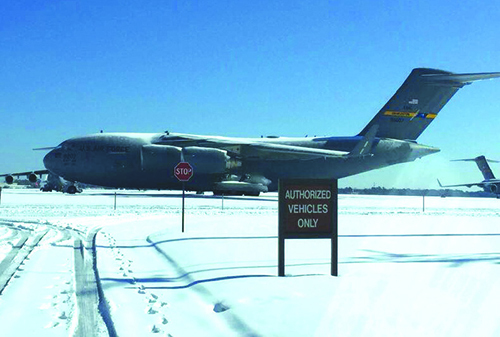 Based on the airfield’s geographic location and the historical infrequency of snow events, the Air Force does not own or maintain any airfield equipment specifically designed for snow and ice removal at Joint Base Charleston and CHS. Furthermore, there was not an effective plan in place for clearing the unexpected ice and snow. However, a coordinated effort between Charleston County Aviation Authority, Joint Base Charleston and Boeing SC safely cleared enough snow and ice to reopen Runway 03-21 by noon on Jan. 6. Flight operations and the entire airfield reopened the following day at 2 p.m.
Col. Jeff Nelson, 628th Air Base Wing Commander, commends the dedication of personnel throughout the base installation to bring the airfield and base back up to full operations—everything from security forces patrolling roadways for travelers to weather specialists monitoring conditions and providing vital storm updates. Local municipalities and the South Carolina Department of Transportation worked hard to clear main roads in the surrounding area, he adds. Subsequent crews that cleared surrounding roads enabled people to travel to and from the airport once the runways were cleared. “It took a great deal of teamwork and resourcefulness throughout the storm, and I’m thankful for the men and women who worked around-the-clock to restore operational capability at the airfield,” says Nelson. Campbell was similarly impressed by and grateful for the widespread responsiveness. After airfield operations returned to normal, CHS and Joint Base officials initiated a comprehensive strategic review. While property damage was nominal, Winter Storm Grayson caused both organizations to incur other costs. Doug Boston, chief financial officer for the aviation authority, estimates that CHS suffered revenue losses from flights, concessions and associated businesses of approximately $700,000. “We realized the need to identify and review the lessons learned from this historic storm to build a better plan to improve our relationships, readiness and response to assist us in clearing ice and snow from the taxiways and runways for future, albeit 20-year, events,” explains Nelson. A taskforce of subject-matter experts was created on Jan. 30 to review lessons learned and study the weather-related emergency response plan for the shared airfield. After five months of discussions, the Joint Base and Charleston County Aviation Authority signed a formal memorandum of understanding to address the cooperation and coordination of snow removal operations at the jointly-used facilities. “We will meet annually in the fall to conduct pre-season winter weather management coordination and issue a plan to each of our organizations to improve our readiness and coordination required for snow and ice removal from the airfield during significant winter weather related events,” says Nelson. The new memorandum does not supersede nor void the more comprehensive existing joint-use agreement between the U.S. Air Force and Charleston County Aviation Authority. To supplement the pre-season coordination meetings, a snow control command structure is ready for activation when inclement winter weather has the potential to affect airfield operations. The command center will coordinate activities related to winter weather response such as pavement clearing operations and airfield assessments. It will help ensure that runways, taxiways and ramps remain operational before, during and after inclement winter weather by providing updates related to current runway surface conditions. Other responsibilities include drafting Notice to Airmen (NOTAM) updates for dissemination; managing inventory, location, storage and staging of equipment and deicing chemicals and applications; and discussing procurement actions and disposal of snow and ice in compliance with the Clean Water Act and applicable state regulations related to stormwater management, snow and ice containment and collection and snow removal. While the new memorandum of understanding dictates increased communications and command, it does not call for the purchase of dedicated equipment to clear snow and ice. Instead, contractors will be put on retainer to bring plows and other equipment to the airfield in the case of another weather anomaly. This approach is more cost-effective given the rare occurrence of snow and ice storms in Charleston, explains Campbell. The recent experience with Boeing SC serves as an effective blueprint. The aerospace company, which is located adjacent to CHS and shares the runways and taxiways with the Air Force Base and airport, used its own equipment to assist Aviation Authority and Joint Base personnel in clearing the snow and ice, returning runways to operational status and fixing damage caused by Winter Storm Grayson. Boeing SC will participate in the planning/response meetings and work with the Air Force Base and Aviation Authority to tackle any future storm issues, although specific duties have yet to be assigned.